Another step closer to converting my tourist visa into a 13A Visa. This is intended as an update for all who are contemplating the same 13A visa process and to those of you who have asked me for the information. I hope what follows is helpful. May I say at the outset that there is no need to pay lawyers or fixers to process this application. It is easy if you complete the forms correctly and follow the simple step by step guide below. For the uninitiated, a 13A Visa is to convert from a tourist visa to a Non-Quota Immigrant Visa By Reason of Marriage. If approved, you, the applicant foreigner, are permitted to stay in the Philippines on a one year Probationary basis. After that it may be converted to a permanent basis. Please note the applicant is the foreigner and the petitioner is the Filipino spouse. All the documents you require are available on the Bureau of Immigration website. 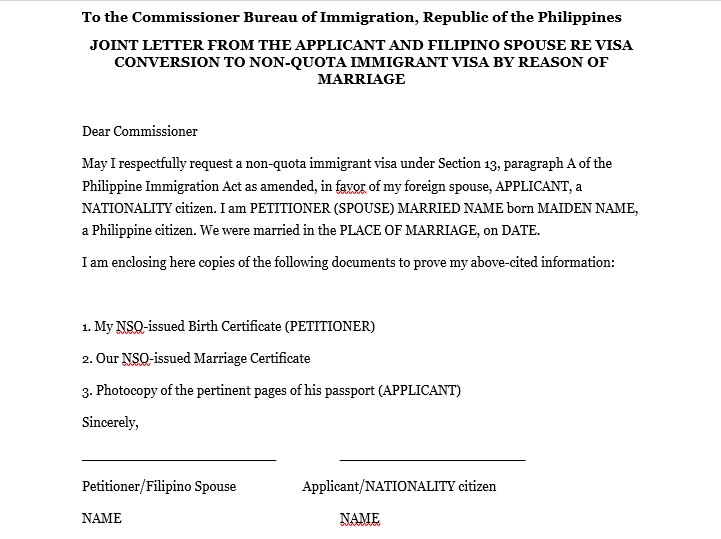 Go to this link http://www.immigration.gov.ph/downloads/checklists-of-documentary-requirements/immigrant-visa and download and print off ONE copy only of V-I-002-Rev 1 Conversion to Non-Quota Immigrant Visa By Marriage (Probationary). That is your check list and guidance instructions. Read carefully and do what it says. You can ignore item 7. (BI Clearance as the BI will issue that at the time of your application) and item 8. to do with quarantine if you are an EU, US, Canadian, Australian, NZ etc. citizen. The check list tells you to use 2 legal size folders. You need to arrange all completed forms and documents in the order they mention in the check list. You also need 2 extra legal size folders at Iloilo and 2 photos 2cms x 2cms of you the applicant. It doesn’t mention that on the check list. Those extra requirements may be peculiar to Iloilo but I say don’t chance it. Take them with you no matter which BI office you go to to make your application. And check that the BI office you go to actually processes 13A Visas. Some don’t, such as Bacolod. Use this Word document as a template to insert your own personal details. This is your petition letter to be signed by you and you spouse as applicant and petitioner respectively. If you have been in the Philippines six months or more then you will need your valid NBI clearance. Your spouse’s birth certificate (NSO original) and your marriage certificate also NSO original copy. 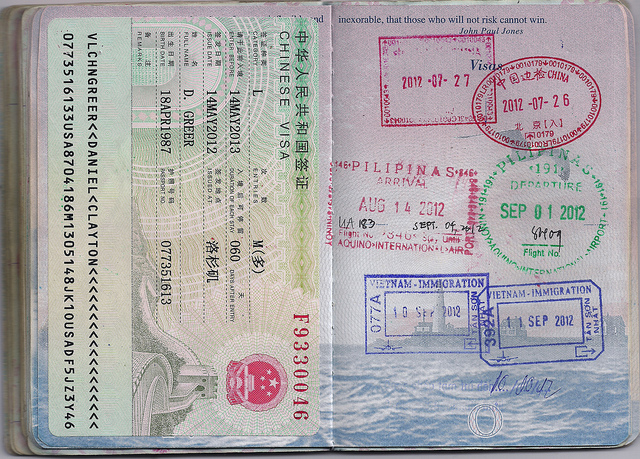 Photo copy of your bio passport page and stamp showing first arrival in the Phils. In total you will pay just over 11,000 pesos that includes the new ACR card. Please note also the Cashier closes at 2.30 pm in Iloilo so make sure you get there early. Once you have submitted your requirements as above, after wet fingerprinting, you will be given an appointment for interview with the Alien Control Officer. That usually takes place within two weeks of the application submission date. Both you and your spouse attend this interview. We were asked how long we had known each other, how we met, and how much I earned and how did I earn my money. It was all straightforward stuff and no need to bring any documents with you to substantiate what you tell them. After the interview, you wait. It can be several weeks before the documents are signed off for approval in Manila. You have to check the website to see when yours is approved. We had our interview in Iloilo on February 13, 2018. I anticipate I will have approval by the end of March 2018. Your biometrics (digital fingerprinting and photo capture) will normally be obtained at the same time as your interview. I say “normally” as I had to make a second trip owing to the biometrics kit being unavailable. Following approval, the BI will issue my new ACR card, and I expect affix a new visa sticker to my passport. The fee I mentioned includes everything. 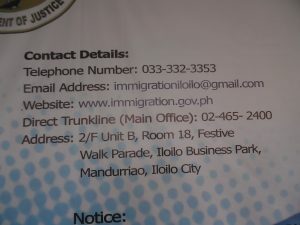 If you use the Iloilo office, like me, please note it is no longer in the old Customs House. It is now located near Megaworld. I was overly optimistic in thinking it would be the end of March when I received approval. It was April 23 but it wasn’t posted on the main BI website until April 27. I feel sure the delay was owing to my biometrics not being completed on the same day as my interview. No, I need to go to Iloilo once more to collect my visa sticker and new ACR card. After that? I’m good until April 2019 but must report in January 2019. I need to go through the whole rigmarole once more before April 2019 to convert from my Probationary 13a Visa to permanent residency by way of marriage. Update as of May 30, 2018. Done and dusted! I now have my new ACR card and a corresponsing stamp (not sticker) in my passport. My 3 years on a tourist visa expired on April 1, 1018 so I incurred a further P 4000 plus yesterday. That included a fee for motion to reconsider (granted in light they knew of my 13A application), two months’ overstay fines, visa extension for two months. Still, it’s all done now (until next time). The BI office in Iloilo is moving again soon so check with them before you set off. Brilliant, thanks for compiling this information and adding what the BI left out. Most welcome. Glad it was of help. Thank you Stephen. Very infirmative. You are welcome. Hope it helped. Thank you for sharing. I am married to a USC and weve been living in the PH since March 2018. He currently has a 1yr balikbayan stamp. Does he need to go with me when I submit the 13a application? Can he just come on the day of the interview? Thank you! Hi Fenny, you will both need to attend at the Bureau of Immigration at the application stage and the interview as you are both treated as the applicant/petitioner respectively. The BI will also need to see your husband’s passport etc. 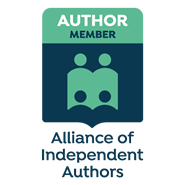 It’s a fairly straightforward process as long as you provide all they ask for and it is presented just like they require. I hope that helps and good luck! HEY BENTLEY, THAT WAS SOME GOOD WORK YOU DID THERE SIR, APPRECIATE IT! THIS MY FIRST DAY OF RESEARCH, GLAD I FOUND YOUR SITE. DURING PROBATION, CAN YOU LEAVE THE COUNTRY AND RETURN WITHOUT BUYING A THROW AWAY TICKET (FORWARDING TICKET)? DID I HEAR YOU SAY THAT AFTER PROBATION YOU ARE REQUIRED TO DO ‘ALL’ THE STUFF OVER AGAIN? ALL OF IT? SMILING..
Hi Oba! GLAD I COULD BE OF HELP! Now I will continue having hit my CAPS key. I suggest you try it 🙂 Once you have your 13a visa for permanent residency, you can leave and return w/o a throwaway ticket as you have your visa on return. You are no longer subject to tourist visa rules. Yes, you are granted a PRV for a 12-month probationary period then have to do it all over again to turn it into a non-probationary visa. But then it’s good for at least 5 years (i think – I need to check on that). Don’t forget those caps now SMILING. Ok, Understand. My caps button has been stuck for a long time, got it fixed today, smiling.. Were you allow to travel back and forth without a throw away ticket while on probation? Or only after probation? It is only on a tourist visa that you need to purchase a throwaway ticket to demonstrate you intend to travel on again from the Phils. You can renew tourist visas for up to 3 years. If you have a 13a visa or any kind of permanent residency visa (PRV), you can fly out of the country and back again no matter if probationary or not. Please note you will need an Exit Clearance Certificate (ECC) before you fly out no matter what your immigration status. That is my understanding. I haven’t done it so I can’t say for sure. I’m not qualified to give legal advice on immigration matters so if I were you, I’d check with the Bureau of Immigration (BI) to make sure. All I can do is give you advice based on my experiences. What is your status? Are you single or married? If married to a Philippines citizen you may be entitled to a balikbayan visa on your return to the Phils. Ok, i will confirm your words with immigrations. i have had a tourist visa for 6 years now, married to a filipina 5 years. yes, the balikbayan visa will work also, but i would prefer to move forward with the 13a, just get it done. i will start the paper work in december, salamat! Glad I could help 🙂 Good luck with the 13a application. Salamat! Hello Sir Stephen. Thank You for posting this useful information. Btw, I am a Filipino married to a Japanese Citizen. He also applied for 13A visa last October 25, 2018 & was interviewed Oct 28, 2018. Tentative date of visa ammendment was Nov7, but until now(Nov28, 2018) there’s no update from BoI Main Office. My husband had to leave the Philippines to do some work in Japan. I just want to ask if you are aware if it is possible to leave the Philippines while waiting for the probationary 13A visa? Thank you so much! Hello Joy! That is a very good question. I don’t know the answer. I do recall the BI asking me if I had any travel plans while waiting for my 13a visa approval. I didn’t so the question or answer did not arise in my case. I suggest you call the BI Office where you processed the visa and ask them. It would be appreciated of you were to leave a further comment here once you get the answer in order to help others in the same position as our husband.